Kashmiri saag is always cooked with whole leaves...however if you want to used chopped palak you may do so. There are no spices added to this. The flavours just come from the garlic, chillies and mustard oil. This recipe is adapted from the TV show on NDTV Good Times- 'CHAKH LE ACADEMY' by Aditya Bal. 1. Heat the mustard oil and add the cardamom, red chillies. Fry them for 1 minute on low flame until there is aroma in the air. 2. Add the garlic cloves and stir fry till they are light brown. 3. Now add the palak leaves. Add salt and simmer to cook in its own water until the oil starts to float on top and the palak leaves are cooked. Sprinkle water only if needed. 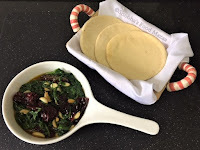 Serve with Kashmiri khamiri rotis. thank you so much for sending them way Shobha. Saag looks a delight to have with rotis. Wow! Simple and so healthy.. Authentic and delicious kashmiri saag. Yup.. but never tasted with rice. Nice and healthy dish !! I too had seen this on Chak le academy, noted it but never got around to making it..Ur pics are tempting me to give it a shot..Thx Shobhaji!!! Please give it a try asap. Simple & healthy dish dear.. Thanks for sening it my event. great dish to make quickly and eat -- and yummy too :) nice recipe dear! Quick simple but a very healthy saag!! I am glad to see you here too Julie. hi shobha, how are you.. nice recipe but i cant try this out , we dont have palak leaves over here ..this recipe is new to me. Love palak and your dish looks very tempting! Saag looks yummy. Thx for linking. Love saag a lot..Delicious n healthy!! Thanx for linking it to my event!! Interesting.. will try it soon and let u know how it came. And it's so easyyy to make! It sounds and looks lovely, comforting but still very healthy. Perfect! I'm linking to my saag recipe page.Just so you know.